Watersheds are the areas of land whose rainfall flows into the same surface source. In metro Detroit, we are within the Rouge River watershed, but we are also within the Great Lakes water basin. Our water goes to (and comes from) a lot of places! In this workshop, students will develop an understanding about Michigan watersheds, human impact and how to protect our lakes and rivers. Kids will explore filtration systems and learn how to keep water resources safe. 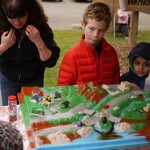 This 50-minute program includes a slide presentation and hands-on activity examining watersheds. Target Grades: K-8. Classroom setting. Travel Fee—For programs outside our local 20 mile travel zone, we charge a nominal trip fee of $.56/mile.